Nairobi National Park, Kenya. Oct. 2016. This group of more than ten are feeding upon a dead insect that had fallen onto the water. 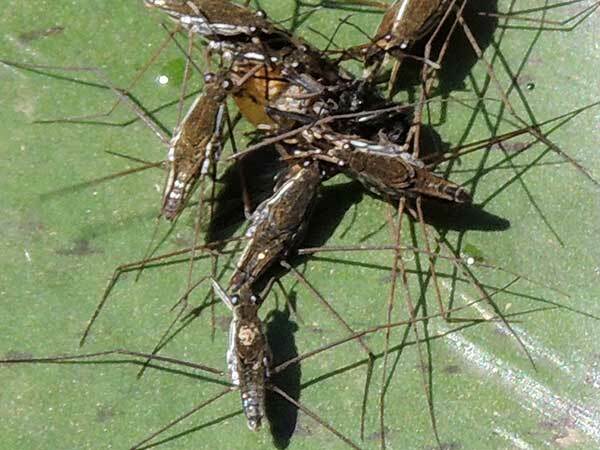 Water Striders are sometimes confused with spiders because of the very long, conspicuous legs - but only six, not eight. Their leg and tarsal structures are able to support these true insects on the surface film of water. There they can maneuver without breaking the surface tension, and quite rapidly at that. Their usual food are insects that die or otherwise end up struggling in the water.